WASHINGTON — Alliant Techsystems (ATK) says NASA isselectively applying a rarely used contracting rule in an effort to halt workon key elements of the agency's Constellation program, a 5-year-old effort toreplace the space shuttle with new hardware optimized for lunar missions thatthe White House has proposed canceling next year. NASA asserts the Constellation program is facing a potential$1 billion funding shortfall in the remaining four months of the current budgetyear because contractors have not accurately accounted for terminationliability costs they could incur as a result of having to cancel orders, vacateleases and pink-slip employees if the program is shut down. But Magna,Utah-based ATKAerospace, prime contractor on the first stage of the Ares 1 rocket ? a keyConstellation program element — says that historically, termination liabilityfunds have not been included in contractor costs. 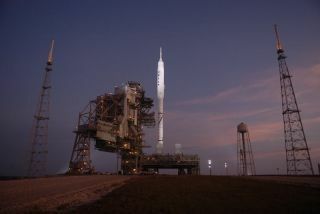 "NASA has chosen to create this fundingshortfall by changing its decades-long management practice with respect totermination liability," Brian Wagner, ATK director of congressionalrelations, said in a June 10 e-mail to lawmakers and staff. "ATK wasspecifically instructed on numerous occasions throughout the history of bothShuttle and Ares contracts not to account for termination liability costs inany accounting we have made for NASA on these contracts." ATK builds the giant solid-rocket motors for thesoon-to-be-retired space shuttle, and variants of these motors would boost theAres 1 and larger Ares 5 rockets. Wagner's e-mail came one day after NASA AdministratorCharles Bolden toldCongress in a letter that slowing down work on Constellation to cover thelooming cash shortfall could result in "contractor workforce reductionsestimated at 30-60 percent of the current population, or 2,500-5,000, for thebalance of the year." But ATK, which has roughly 1,500 employees assigned toConstellation, asserts the funding shortfall is contrived. "If NASA had continued to operate for the remainder of[fiscal year 2010] under the same practices it has used for decades, instead ofsuddenly and drastically changing their approach to termination liability withonly four months remaining in the fiscal year, there would be no fundingshortfall at all, and it would be completely compliant with Congressional direction,"Wagner wrote in the e-mail. Moreover, the e-mail claims, "there would be a $3million surplus by NASA's own estimates, for the Constellation work planned"during the year. Bolden's letter said NASA is confronting an estimated $994million in potential costs associated with ending Constellation, which inaddition to the Ares rockets includes the Orion crew capsule and other systemsneeded to replace the space shuttle and eventually return astronauts to theMoon. Orion is being developed by Denver-based Lockheed Martin Space Systems. "Once these termination liability estimates areaccounted for, the overall Constellation program is confronting a totalestimated shortfall of $991 million for continued program effort for thebalance of the year, compared with the revised FY 2010 plan," said Bolden'sletter, which was sent to key House and Senate lawmakers including Rep. BartGordon (D-Tenn.), chairman of the House Science and Technology Committee, andSen. Bill Nelson (D-Fla.), who chairs the Senate Commerce science and spacesubcommittee. "Under the Anti-Deficiency Act, NASA has no choice but tocorrect this situation." NASA officials say contractors are bound by a boilerplateclause included in most agency contracts to set aside current-year programfunds to cover potential termination liabilities. "NASA funds contracts and the prime contractors managethat funding, which include potential termination liability," NASAspokesman Bob Jacobs said in a June 11 e-mail. "This is not a newpractice. We simply cannot dedicate funds to contractor costs above and beyondthe amount legally allotted to those agreements. We have no option but to takesteps that put us in alignment with appropriations law." In his letter, Bolden told lawmakers that given the estimatedfunding shortfall, "the Constellationprogram cannot continue all of its planned FY 2010 program activitieswithin the resources available." Bolden said NASA would "generally provide no additionalfunding" for development of Ares 1's first stage, and would "descoperemaining contracts, and reduce support contractor levels." In contrast, the letter said Orion, originally designed tolaunch atop the Ares 1, would get top priority for available funding as NASAdetermines how best to develop a slimmed-down version of the capsule for use asan emergency lifeboat at the international space station. Privately, NASAofficials have said that development effort could cost $5 billion to $7billion. The letter said secondary priority would be assigned tocontinuing work on the J-2X, an engine designed by Canoga Park, Calif.-basedPratt & Whitney Rocketdyne to power the second stage of the Ares 1 andheavy-lift Ares 5 rockets. NASA recently was tasked by the White House tosettle on an alternative heavy-lift rocket design by 2015, and several of theoptions being studied would utilize the J-2X in some capacity, according tobriefing charts that NASA exploration chief Doug Cooke presented tocongressional staff members in May. In addition to the slowdown for Ares 1, the letter said $89million for Constellation ground operations would be cut, reducing "supportcontractor levels, task order scope and, operating cost. Effort will be made topreserve work to enable flight test strategy but with schedule impact." Other areas to be scaled back include the work onConstellation's extravehicular activity suit and on program integration,according to the letter. Several influential lawmakers oppose the White House's planto cancel Constellation, and Congress last year passed appropriationslegislation barring NASA from doing so until a replacement program is approvedby Capitol Hill. Bolden's letter sparked outrage among some lawmakers, notablySen. Richard Shelby (R-Ala.), who said NASA is ignoring that legislation. "NASA's leadership has taken another step to cedeAmerica's leadership in space exploration," Shelby, whose state stands tolose jobs if the Ares rockets are canceled, said in a June 10 e-mail to SpaceNews. "NASA is reprioritizing funding based on a future budget thathas not been supported, or approved, by Congress." Sen. Kay Bailey Hutchison (R-Texas) also accused the agencyof skirting the 2010 law. "For months, NASA's leadership has claimed they are notworking to subvert Constellation, despite information to the contrary,"she said in a statement issued by her office June 10. Meanwhile, Gordon and other top lawmakers on the HouseScience and Technology Committee have given NASA until June 16 to flesh outcost and schedule estimates for a slimmed-down version of Orion. Jacobs, the NASA spokesman, said the agency is working togive the committee the information it seeks on the Orion lifeboat's cost andschedule as well as whether the agency would modify Lockheed Martin's Orionprime contractor put the project out for bid. "We will work to provide the requested budgetaryinformation as requested by the Committee leadership," Jacobs said June10. "There is an internal team within Exploration Systems making the Orionassessments." The House Science and Technology Committee's request, madeJune 10 in a letter to Bolden, comes as the oversight committee draftslegislation authorizing NASA programs and spending levels for at least the yearahead.